A busy day with a slow start. With Keith losing his voice, we have two interviews with journalists from two separate Saudi newspapers. 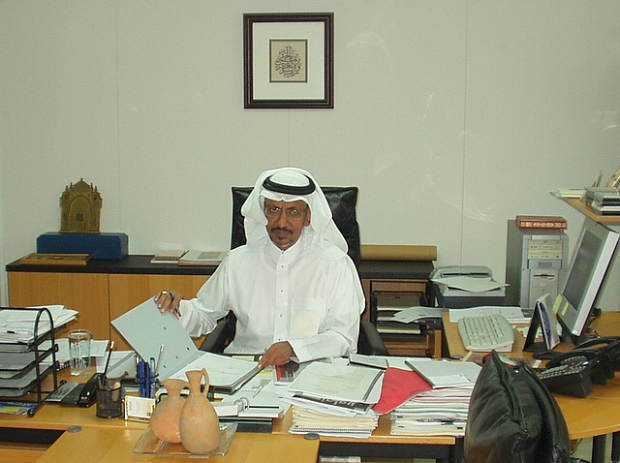 Professional photographers were there to take pictures and Al Turath's competent translator, Ahdel, played a crucial role. Time was also spent discussing photographs and planning our program activities. 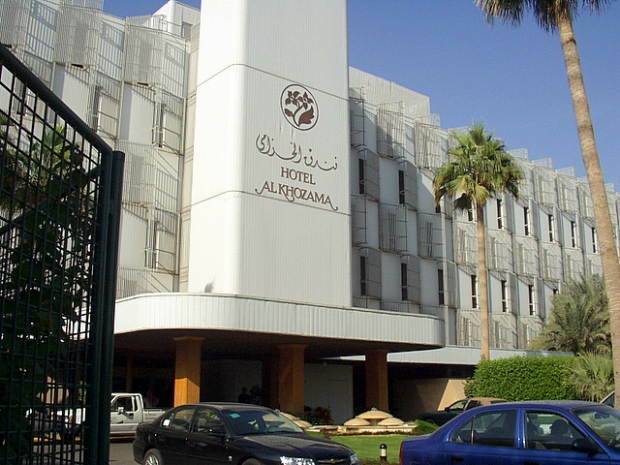 The Al Khozama Hotel, our home for the week. 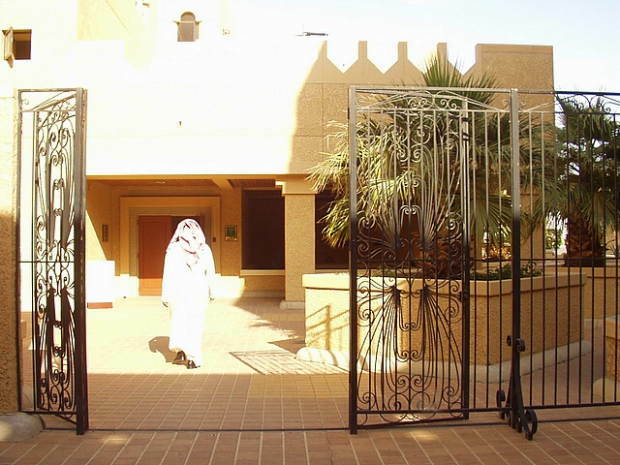 A top quality hotel with fine service and excellent dining facilities. 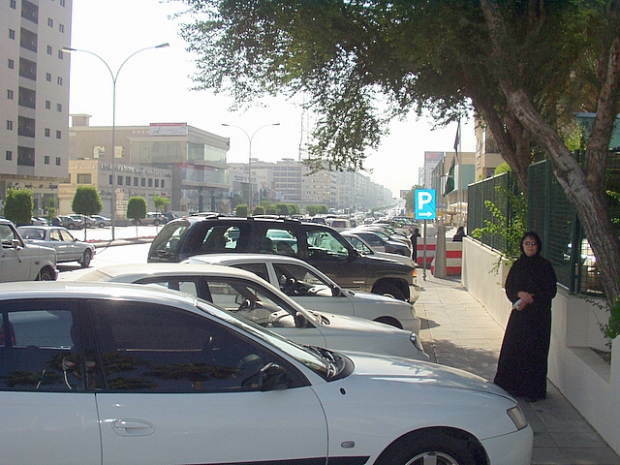 Peg takes a morning walk outside where parking is confined by security constraints of barricades and check points. 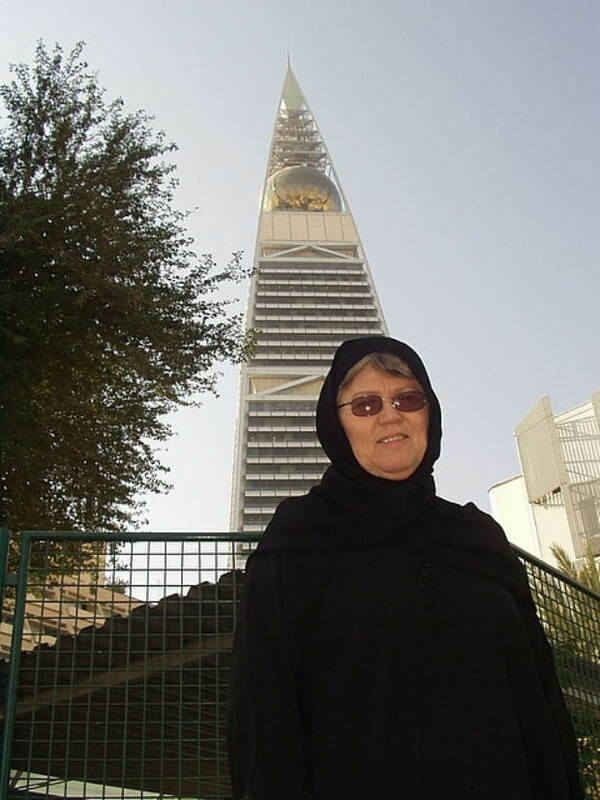 In the interior garden Peg stands before landmark skyscraper, the Faisaliah tower and shopping mall a short walk away. 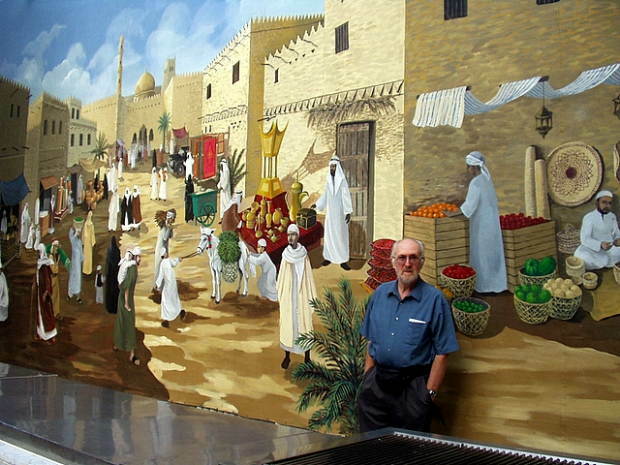 An interesting mural in the Hotel courtyard depicts an early souk scene of early Riyadh. 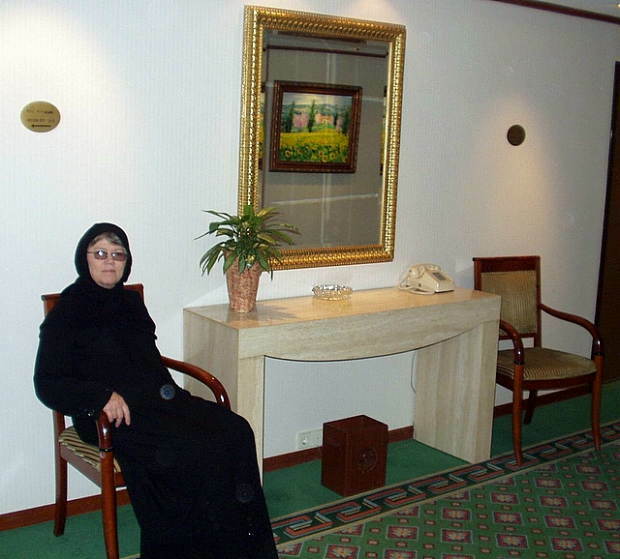 Waiting for the elevator gives us a chance to photograph Peg in her abaya. 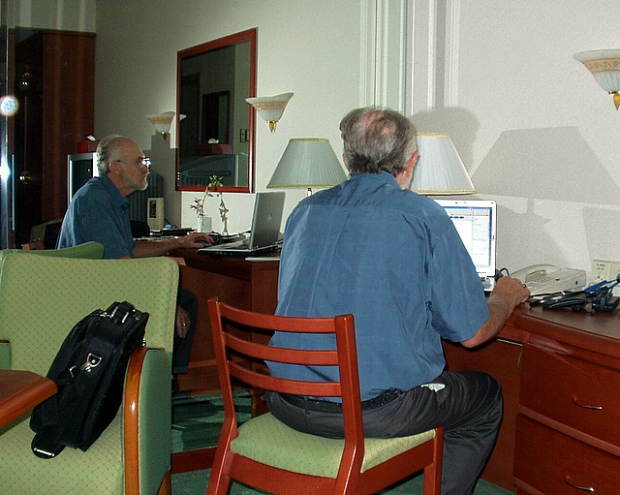 A typical photo of Keith in the hotel room at the computer, processing images and e-mails home. 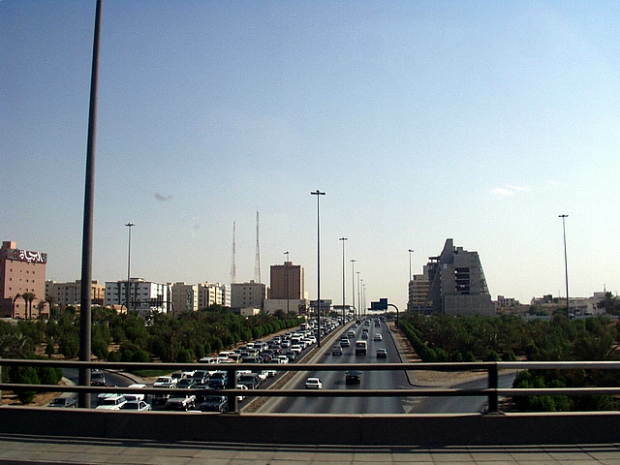 Multilane freeways provide access to parts of town that was mostly desert when Keith was here 45 years ago. Neatly landscaped drives lead in to the offices and shops and parking that are the DQ. 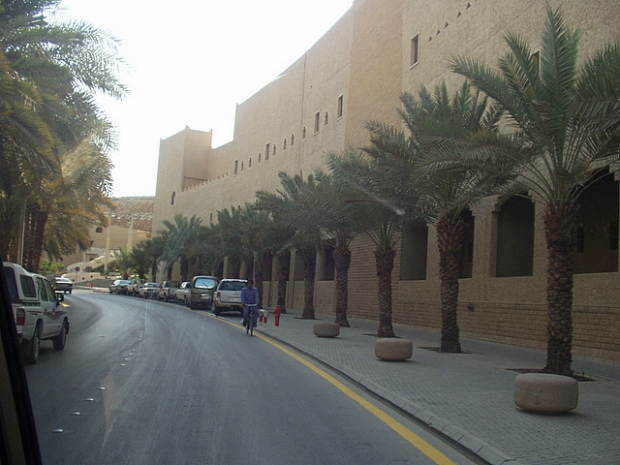 Aesthetic courtyards, fountains, and landscaping contribute to this functional government complex. At last we meet. The relationship that has grown through e-mail correspondence, becomes warmer by the friendly presence of this person. 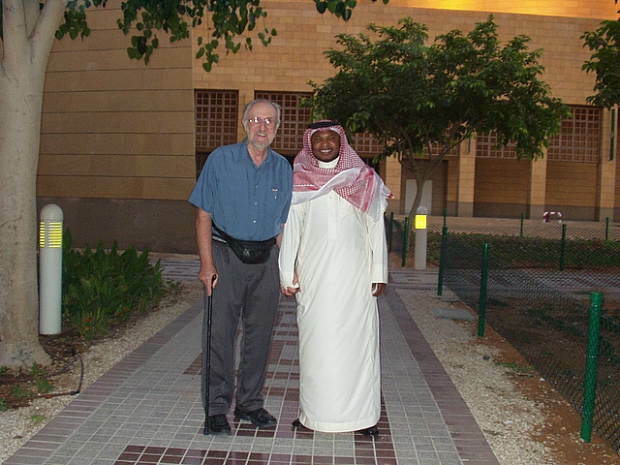 After two interviews by different journalist , Keith and our driver, Yuseff, stand before the entrance to the National Museum. 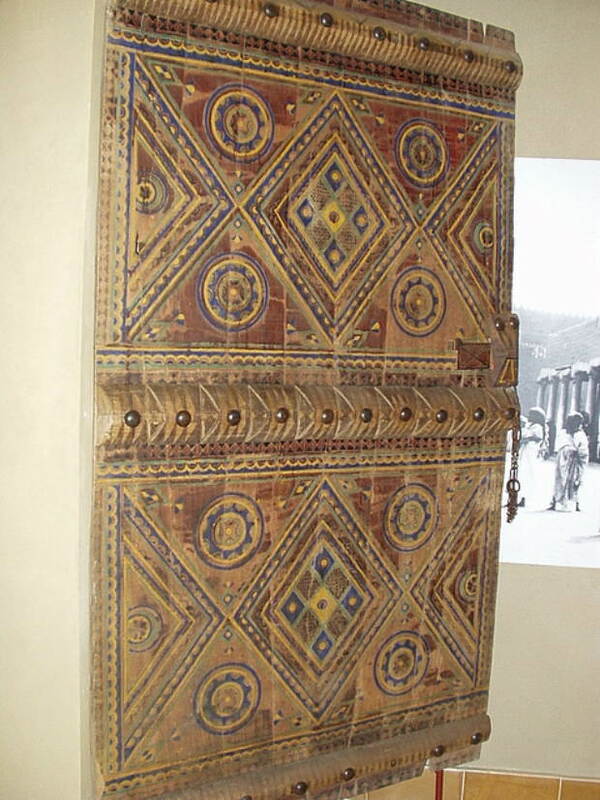 A fine and ancient example of a traditional Saudi wooden door. This is a wonderful, world-class museum, but we took very few photos inside. 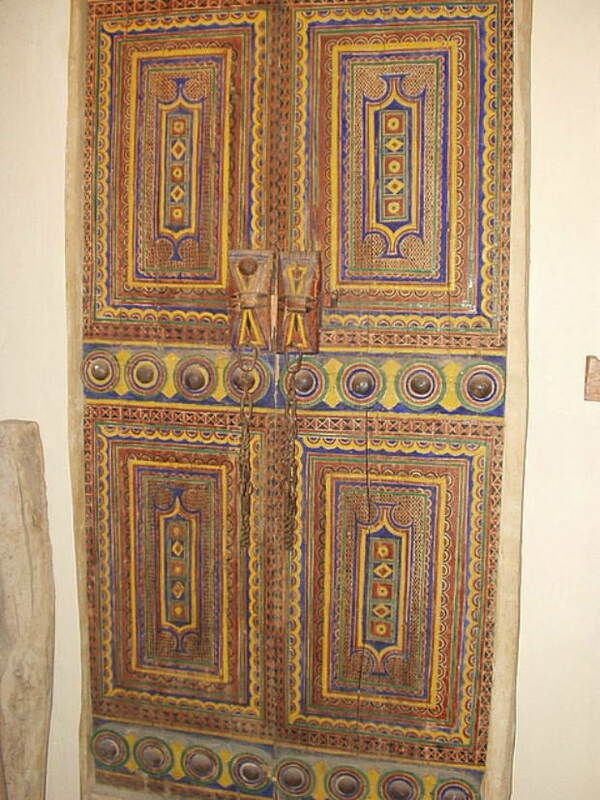 Another historic door featuring the characteristic geometric motif and primary color scheme. 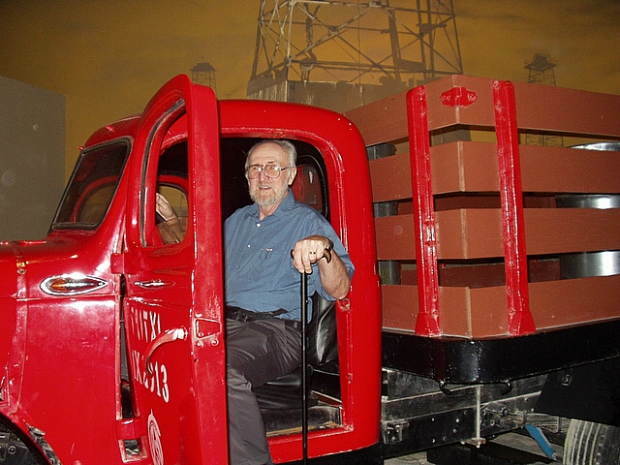 Keith "drives" a representative delivery truck of yesteryear. These 3 interior Museum photos do no justice to the outstanding displays that trace life in this region from beginning of time up to the development of oil resources. 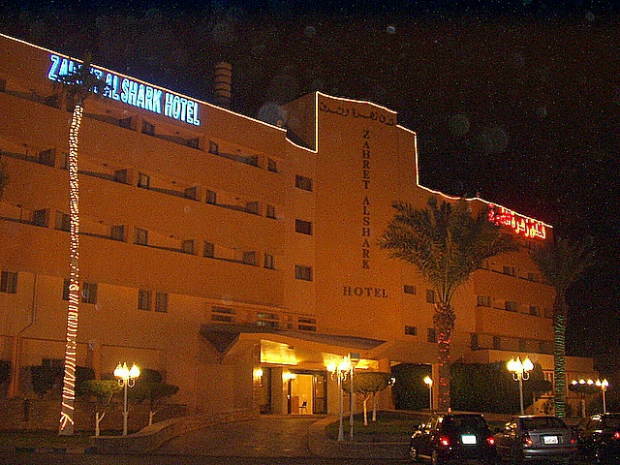 The old Zaret al Shark Hotel still stands as one of the few familiar sites for Keith. Zahir thoughtfully hosted our meal there this night for nostalgic purposes. 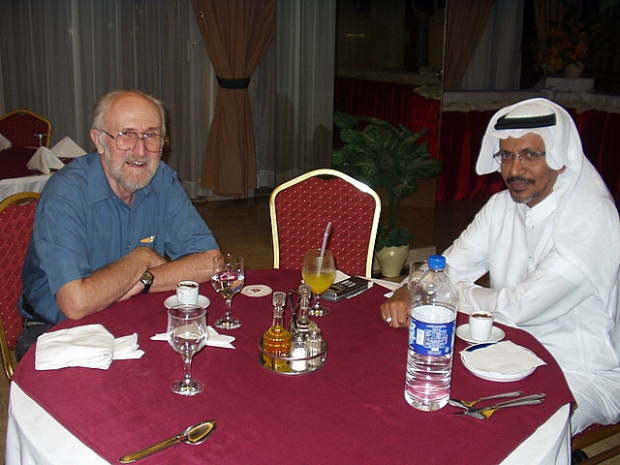 Keith and Dr. Zahir get better acquainted over dinner through active conversation touching on many common interests, politics not excluded. Evidence of a grand past were still apparent in the large and spacious dining hall. 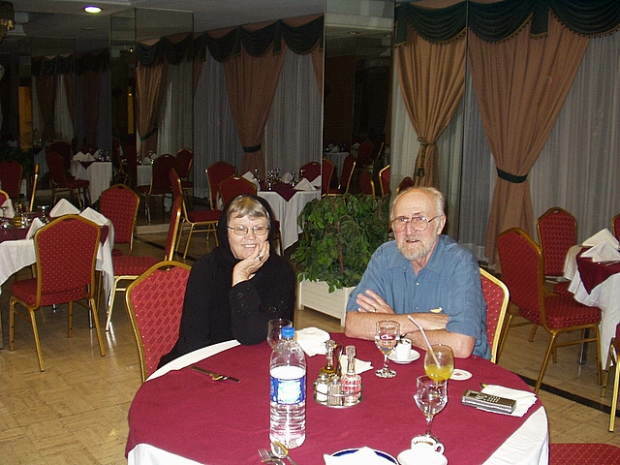 Our traditional meal was wonderfully tasty - the personal interchange most memorable.